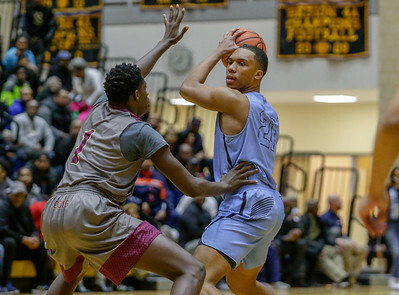 Guard Isaiah Gross scored a game-high 32 points to lead Eleanor Roosevelt High School to a 74-61 victory over Frederick Douglass to win the Prince George's County Championship on Feb. 27. Photo by Michael Smith/The Prince George's Sentinel. 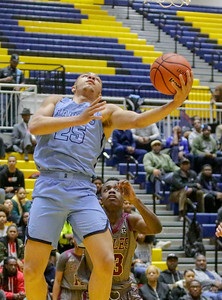 Upper Marlboro, MD, Wednesday, February 27, 2019: Isaiah Gross (25) of Roosevelt takes a shot in the land during the Prince George's County Boy's Basketball Championship held at Henry A. Wise High School in Upper Marlboro, MD. (Michael R. Smith/The Prince George's Sentinel). 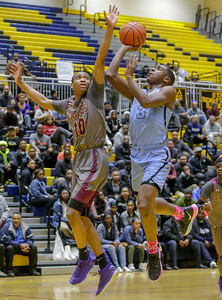 Upper Marlboro, MD, Wednesday, February 27, 2019: Jamal Cochran (21) looks to make a pass during the Prince George's County Boy's Basketball Championship held at Henry A. Wise High School in Upper Marlboro, MD. (Michael R. Smith/The Prince George's Sentinel). 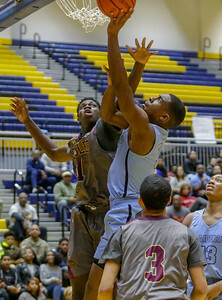 Upper Marlboro, MD, Wednesday, February 27, 2019: Cameron Brown (3) of Roosevelt puts up a shot over Abdou Samb (1) of Douglass during the Prince George's County Boy's Basketball Championship held at Henry A. Wise High School in Upper Marlboro, MD. (Michael R. Smith/The Prince George's Sentinel). 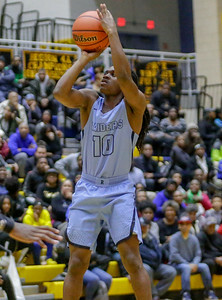 Upper Marlboro, MD, Wednesday, February 27, 2019: Cameron Brown (3) of Roosevelt takes shot in the lane during the Prince George's County Boy's Basketball Championship held at Henry A. Wise High School in Upper Marlboro, MD. (Michael R. Smith/The Prince George's Sentinel). 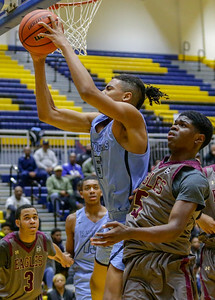 Upper Marlboro, MD, Wednesday, February 27, 2019: Cameron Brown (3) in action during the Prince George's County Boy's Basketball Championship held at Henry A. Wise High School in Upper Marlboro, MD. (Michael R. Smith/The Prince George's Sentinel). 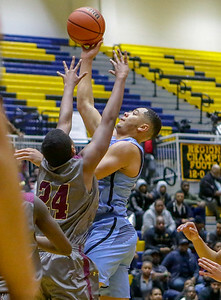 Upper Marlboro, MD, Wednesday, February 27, 2019: Jasmir Butler (5) grabs an offensive rebound during the Prince George's County Boy's Basketball Championship held at Henry A. Wise High School in Upper Marlboro, MD. (Michael R. Smith/The Prince George's Sentinel). 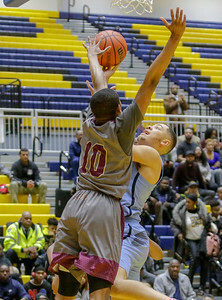 Upper Marlboro, MD, Wednesday, February 27, 2019: Isaiah Gross (25) takes shot over Kaylen Vines (10) of Douglass during the Prince George's County Boy's Basketball Championship held at Henry A. Wise High School in Upper Marlboro, MD. (Michael R. Smith/The Prince George's Sentinel). 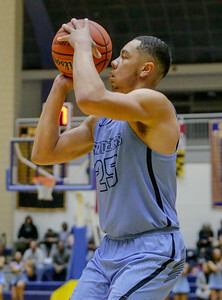 Upper Marlboro, MD, Wednesday, February 27, 2019: Isaiah Gross (25) puts up a shot during the Prince George's County Boy's Basketball Championship held at Henry A. Wise High School in Upper Marlboro, MD. (Michael R. Smith/The Prince George's Sentinel). Upper Marlboro, MD, Wednesday, February 27, 2019: Isaiah Gross (25) goes up for a layup during the Prince George's County Boy's Basketball Championship held at Henry A. Wise High School in Upper Marlboro, MD. (Michael R. Smith/The Prince George's Sentinel). 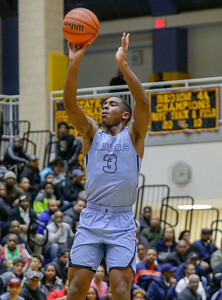 Upper Marlboro, MD, Wednesday, February 27, 2019: Kyle Rose (4) of Roosevelt shoots a jumpshot during the Prince George's County Boy's Basketball Championship held at Henry A. Wise High School in Upper Marlboro, MD. (Michael R. Smith/The Prince George's Sentinel). 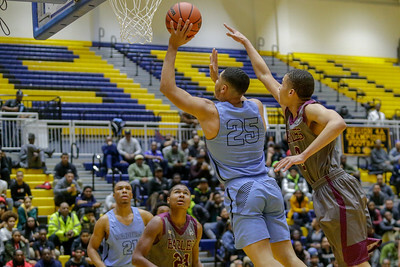 Upper Marlboro, MD, Wednesday, February 27, 2019: Isaiah Gross (25) of Roosevelt takes a shot during the Prince George's County Boy's Basketball Championship held at Henry A. Wise High School in Upper Marlboro, MD. (Michael R. Smith/The Prince George's Sentinel). 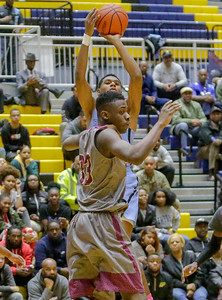 Upper Marlboro, MD, Wednesday, February 27, 2019: Olumide Lewis (10) takes a shot during the Prince George's County Boy's Basketball Championship held at Henry A. Wise High School in Upper Marlboro, MD. (Michael R. Smith/The Prince George's Sentinel).